Complete coverage of the Goldman Sachs Senate hearings where executives, including CEO Lloyd Blankfein, were grilled by the Senators over the SEC fraud allegations. 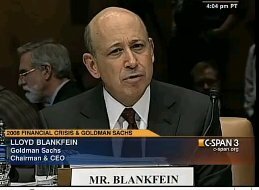 Below are a few videos that highlight exactly what took place on Capital Hill today during the Goldman Sachs hearing – these videos highlight the sparing and attacks of the Senators on people like the Goldman CEO Lloyd Blankfein. Senators grilled the Goldman Sachs executives for 8 hours, and even prevented some people from taking a bathroom break for nearly 4 hours just because they (the Senators) were afraid that the executives would get some information while using the restrooms.